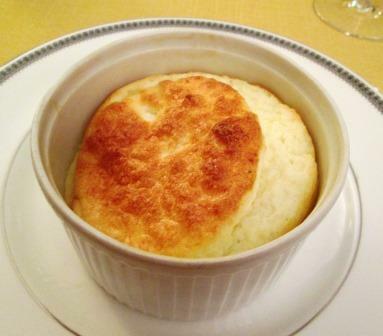 Individual mozzarella soufflés make a nice, light first course for a dinner: simple, elegant, and delicious. True, all soufflés require special efforts, but these are much less trouble to make than large traditional ones. More of the preparation can be done in advance, assembly is easier, baking time is shorter, and the finished dish is not as fragile and quick to deflate as most soufflés are. 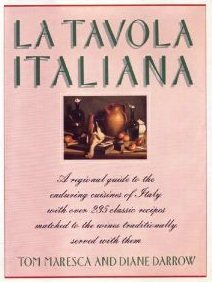 For this recipe, from Tom’s and my book La Tavola Italiana, there are two major considerations: having a lot of egg whites available (the recipe doesn’t use any yolks) and having an electric mixer capable of rapidly whipping the whites to stiffness. Those are easy for me, because (a) I often use more yolks than whites, so I keep a container of extra whites in the freezer, and (b) my heavy-duty Kitchen-Aid mixer whomps egg whites in next to no time. 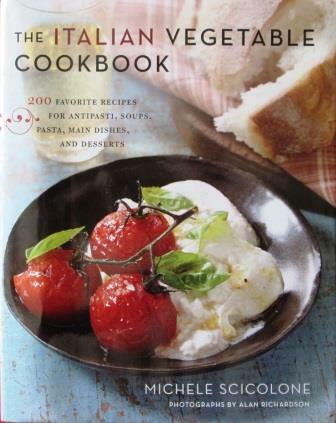 Of course, the better the quality of the mozzarella you use, the better the soufflés will taste. 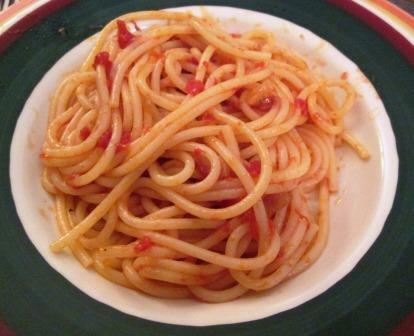 As always with Italian cooking, the prima materia is crucial. Are you still with me? I hope I haven’t discouraged anyone. What follows is an account of four of these little soufflés that I made the other day for dinner with my brother- and sister-in-law. 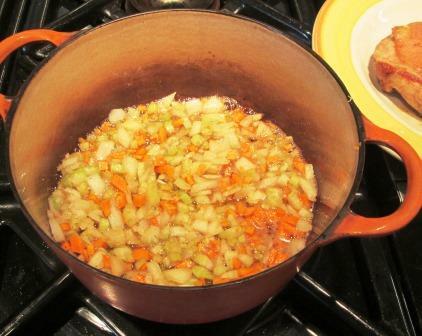 In the afternoon, well before dinnertime, I made up the sauce base. 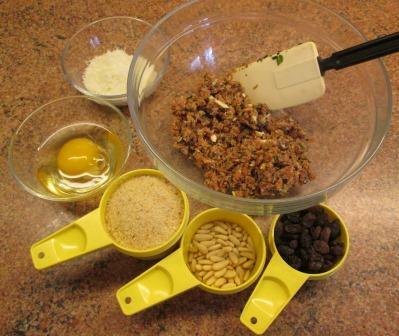 This required melting two tablespoons of butter in a pot, stirring in two tablespoons of flour, and cooking over low heat for two minutes, stirring and not letting the flour brown. 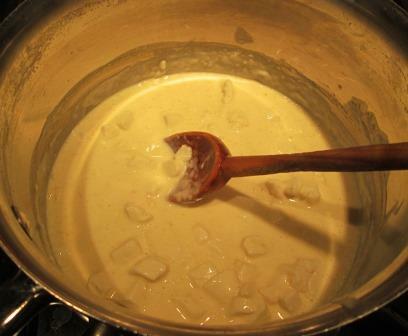 Off heat, I dribbled in a cup of heavy cream, vigorously stirring to keep the mixture smooth. Then I returned the pan to low heat just long enough to stir in half a cup of grated parmigiano and eight ounces of diced mozzarella. This base sat at the back of the stove, uncovered and requiring no attention, for several hours. 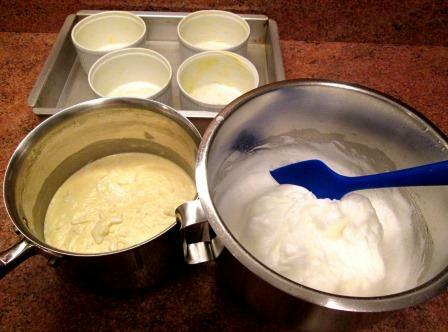 Also early in the day I defrosted ¾ cup of egg whites (six eggs’ worth) and buttered four 1½ cup ramekins and set them aside. 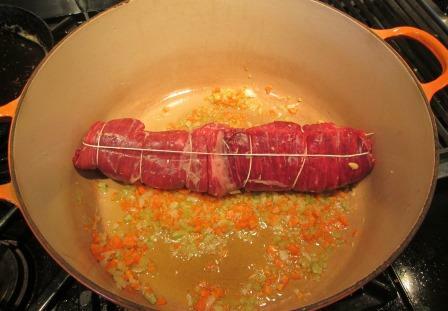 In the evening, all that was left to do was whip the whites and fold them into the sauce base. 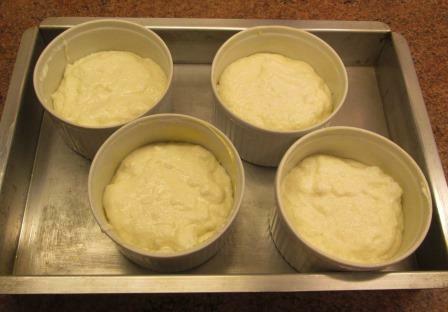 For ease in getting them into and out of the oven all at once, I set the filled molds in a shallow (empty) baking pan. After 20 minutes at 375º the soufflés are normally done, but I think my oven needs adjustment; this time I had to give them 10 more minutes. 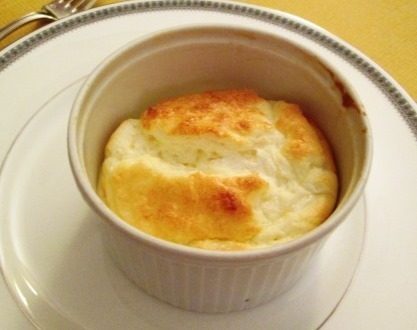 They never do rise as high as conventional soufflés, so you don’t get airy towers of custard. But as I said above, they don’t sink as fast either, so you don’t have to sprint to get them – and your diners – to the table. Even when they do deflate a bit, they still have a lovely soft, pully texture under the thin, crisp crust. 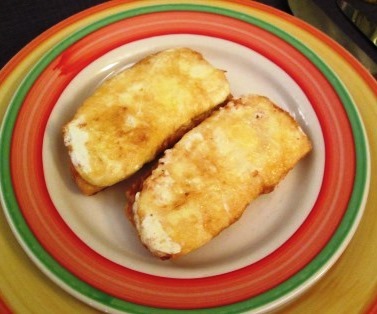 They have both intensity and delicacy of taste and texture that you wouldn’t think mozzarella would provide. 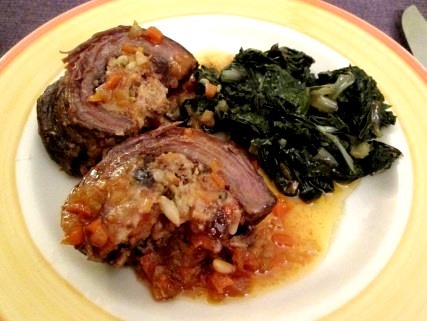 In short, they’re a very satisfactory dish, well worth the effort required. 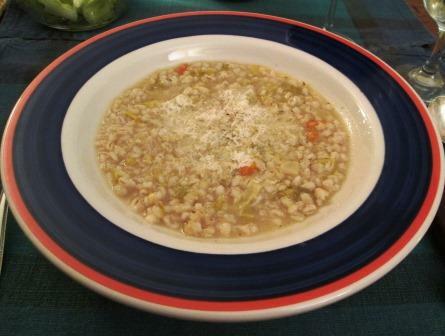 Last week I wrote about a nearly star-crossed dinner at which several of the dishes were brutti ma buoni – ugly but good. I saved a description of the evening’s dessert for its own post, to celebrate its supreme ugliness. 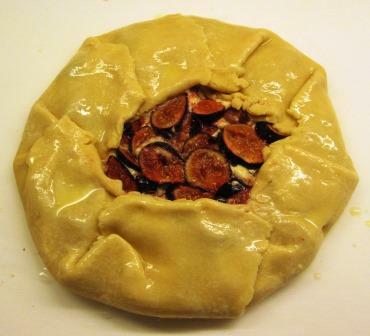 Here it is: my fig and almond crostata, just as it came from the oven. Pitiful! The attempt at this dessert came about because, all through February and March, my local markets were getting beautifully ripe black Mission figs from Mexico. After enjoying several out-of-season antipasti of prosciutto and figs, I began thinking of fig desserts. 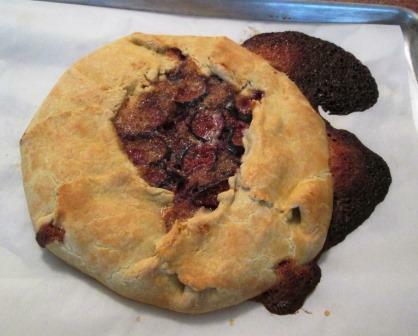 This made Tom very happy, whose passion for figs I’ve already written about in connection with a Dalmatian fig tart, so I wanted to try something new. 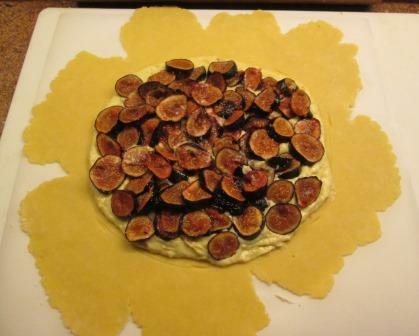 I found an interesting looking recipe online for a partially open-faced fig and almond crostata, so I tried a small version – one just big enough to accommodate the number of figs I had on hand. In making it I used a few shortcuts, including a batch of made pastry dough that I had in the freezer, plus a few guestimates on quantities, and was pleased when the crostata came out very well. Leftovers even kept without losing goodness for several days. Okay! I thought: This is one to remember. 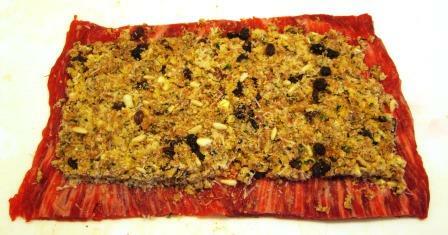 Now I’ll make a full-size version for my upcoming dinner party, following the recipe exactly. That should be a really fine cap to the meal. 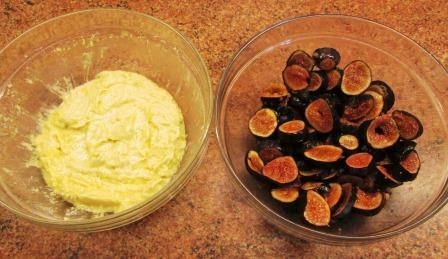 On the morning of the party, I washed, dried, and sliced two boxes of ripe figs. For the cream filling I ground blanched almonds with sugar in a food processor; added an egg, softened butter, a little flour, vanilla, and salt; and processed again until smooth. 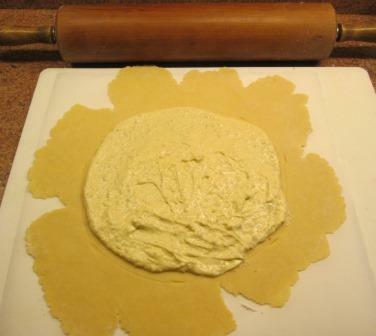 The day before, I’d made the pastry, carefully shaped it into a flattened round, and chilled it overnight. Annoyingly, when rolled out to the specified size, it didn’t hold its roundness but split into big uneven flaps between deep indentations. I hoped that might not be a problem, since I would be folding and pleating the pastry over the filling anyway, so I went ahead and spread the almond cream in the center. The cream filling lay much thicker than it had in my test version, and the figs had to be piled higher too. Maybe for that first one I’d rolled out too large a piece of pastry for the amount of filling? But it was good that way; maybe this will be even better. Still hopeful, I folded, tucked, and rounded the crostata and gave the pastry a coating of egg wash before putting it in the oven. There was nothing I could do but chop away the burnt almond cream and try to close over the holes in the crust – which hadn’t browned and firmed as nicely as the earlier version did. This crostata was definitely one of the brutti. 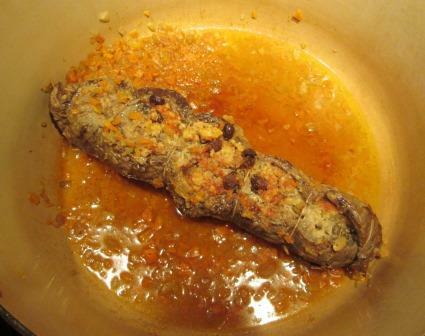 So ugly was it that I never let the guests see the whole dish. 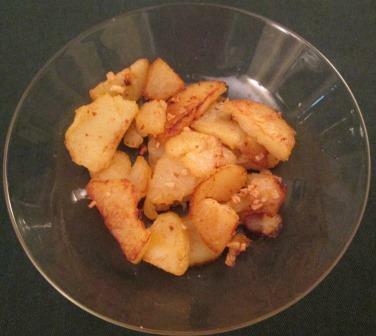 In the kitchen I cut individual portions as neatly as I could and brought them to the table. And they were very good! 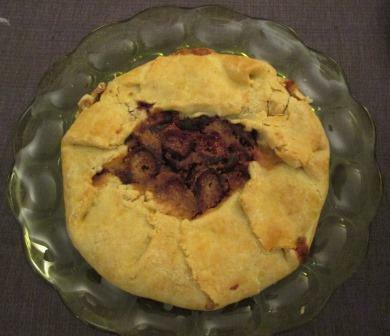 Though the crust was softer than I’d have liked, the flavors of fig and almond were in excellent balance, and the quantity of filling seemed just right. The full amount of almond cream would, for me, have unpleasantly dominated the dish. Losing so much of it was a brutti ma buoni blessing in disguise. The passionate fig fancier agreed. 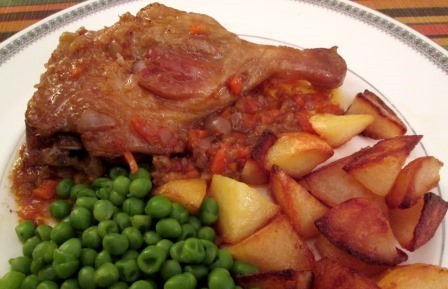 Whenever I cook duck legs for dinner, Tom and I remark that we should have them more often. These small, neat packets of succulence are far easier to prepare – and have a higher proportion of meat to bone and fat – than a whole duck. Legs aren’t always available in stores, however, so on our occasional day trips out to eastern Long Island I always try to get some from a poultry farm that we patronize. That part of Long Island has long been famous for raising Pekin ducks. Back in the 1930s it’s said that there were as many as 90 duck farms in the area. 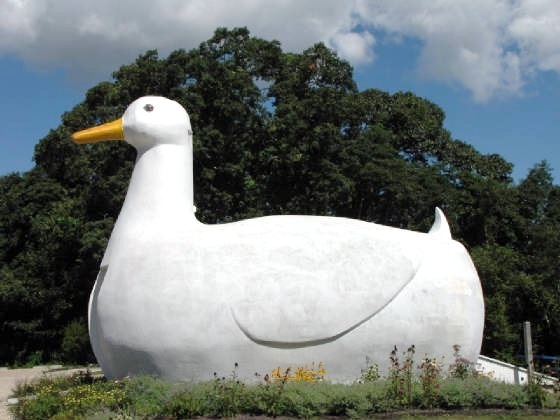 One that I remember fondly from family summer vacations in my youth was this one, known to all and sundry as The Big Duck. This 30-foot long, 20-foot high creature was originally the duck farm’s retail store. Now a tourist center and gift shop, it’s listed on the National Register of Historic Places. Italian duck breeds being much less fatty than Pekins, I did have to scrape some fat from my legs, but they didn’t have the gobs and layers of it that other parts of a duck’s anatomy have. I suppose that’s because legs do all the work in the water, which keeps them muscular, while the rest of the body just floats along on top, fat keeping it warm. 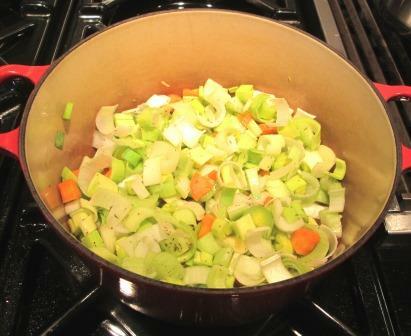 As often is the case, I was scaling down a recipe for a whole cut-up duck, so my faithful knife man did the initial job of chopping two stalks of celery, a third of a large onion, and a third of a carrot. 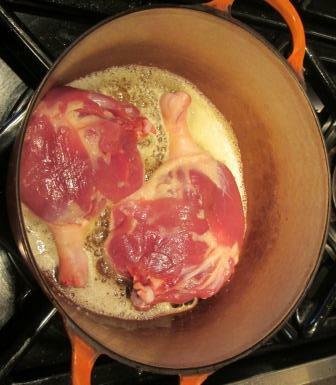 While he was doing that, I heated a flameproof casserole and lightly browned the legs in butter and olive oil. 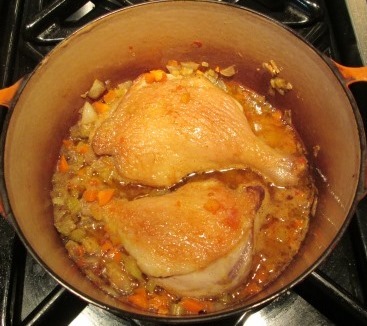 The legs came out to a plate and the vegetables went in, to cook gently over low heat. 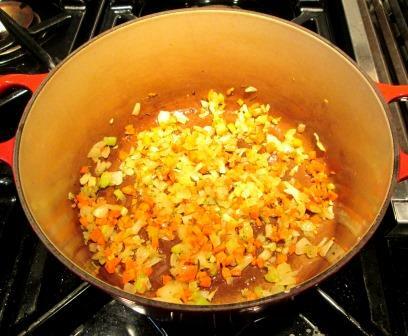 When the onions were translucent, I stirred in salt, pepper, and just a little liquid – 4 teaspoons of tomato sauce and 2½ tablespoons of water – returned the legs to the pot, and brought the liquid to a simmer. 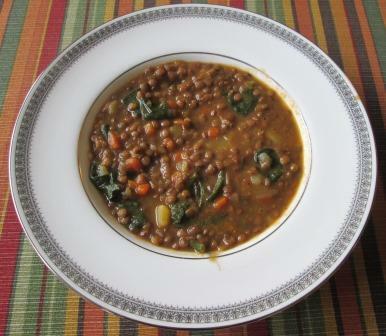 From this point on, all the dish requires is patience: It took two hours of simmering, but the result was well worth the time. 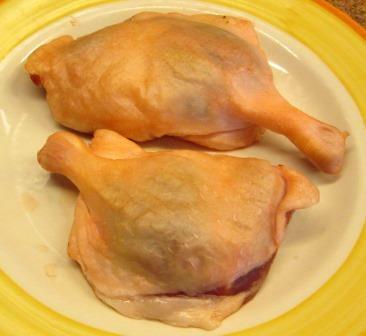 The legs were fork-tender and luscious, and the nubbly sauce was a rich melange of vegetable flavors. 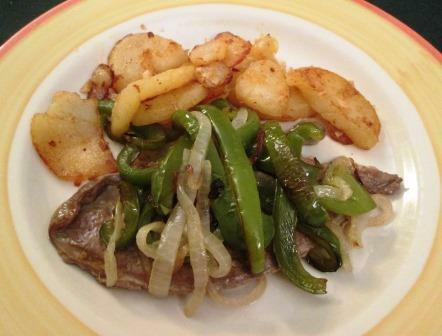 Crisp sautéed potatoes and good Italian frozen peas made excellent foils for both meat and sauce. “Rich” and “luscious” are unquestionably overworked words in the food vocabulary, but they’re unavoidably accurate to describe a fine duck dish like this one. 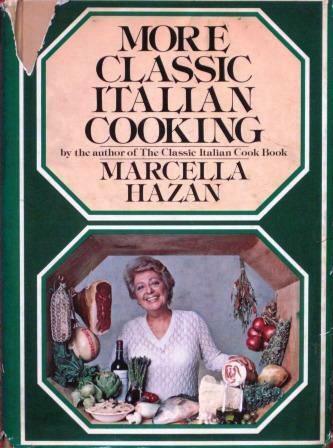 The other day I idly pulled out my copy of Marcella Hazan’s More Classic Italian Cooking. 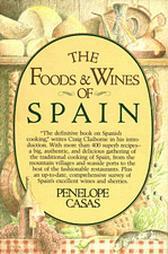 I’ve had the book ever since it appeared in 1978 but have rarely used it in recent years. Turning pages, I found many recipes I’d completely forgotten about. 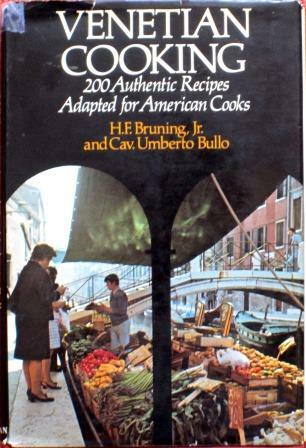 Now, I yield to nobody in my reverence for Marcella – “the first name in Italian cooking,” as she was billed in her early days – but this, her second book, is not in my opinion equal to her first. There she stayed mainly in her comfort zone of Bolognese and Emilia-Romagna cooking, but here she broadens out to other Italian regions. I feel that her southern Italian recipes, especially, don’t reflect the sure hand she had with the dishes of her native region. 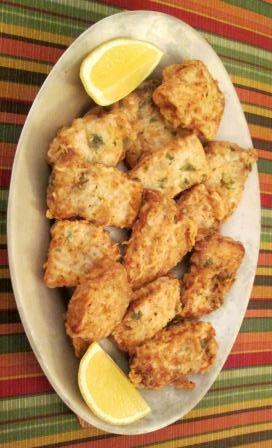 Ignoring those reservations on this occasion, I was attracted to her Sicilian recipe for Bocconcini di Pesce Spada Fritto – fried swordfish tidbits. 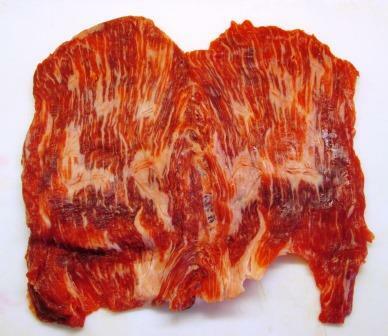 In the headnote she says Sicily has the finest swordfish in the world. From my admittedly modest experience in that region, I agree. She also says this preparation keeps swordfish “as moist and tender as it was when it first came out of the sea.” For that, I’d give it a try. 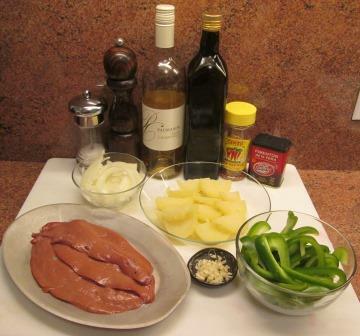 The recipe needs fairly thin slices of the fish. 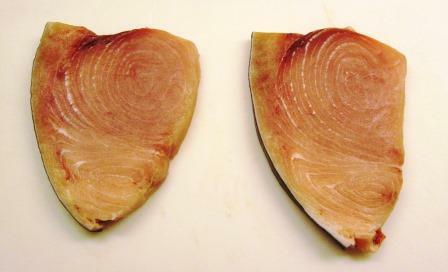 I was able to get my local fish store to butterfly a New-York-standard-sized swordfish steak to yield two more or less ¾-inch thick pieces. 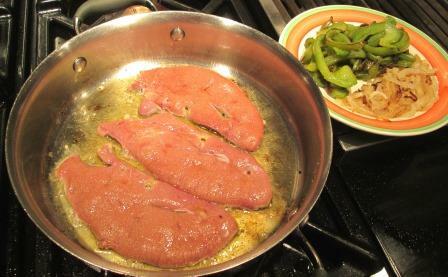 I cut them into smaller pieces, as directed, and put them into a marinade of olive oil, lemon juice, parsley, salt, and pepper for two hours at room temperature, turning the “tidbits” occasionally. 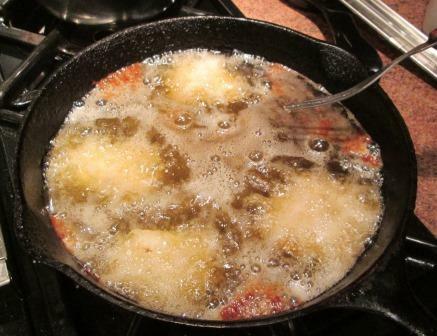 Then they had to be patted dry and dipped in egg and flour to be ready for frying. Next, I may have made a bad mistake. 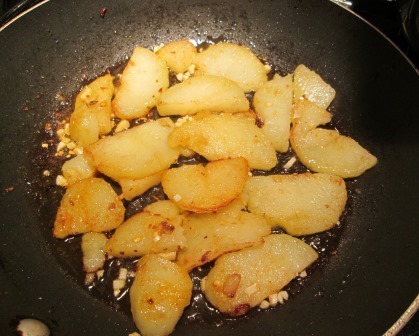 I had some lightly used frying oil that could handle one more use, so I poured it into a pan and got it hot – without rechecking the recipe’s instruction. Which, I saw when I did look back, called for only ¼ inch of oil. Mine was over an inch deep. Well, I said to myself, this fish is to be fried, not sauteed. Surely it will cook just as well, and probably even faster, this way. So in the pieces went. They took quite a bit longer than I expected to develop the indicated light golden crust, and even though I’d carefully shaken off the excess egg and the excess flour, the coating seemed unusually thick and rough. To my regret, I can only call this dish mediocre. The swordfish had stayed moist, all right, but the strong flavor of eggy, oily crust was the predominant note on the palate. 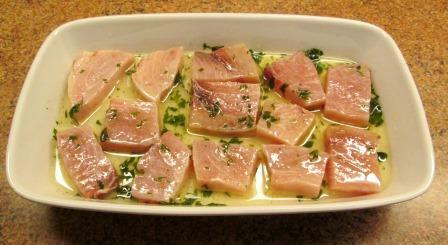 That, and maybe also the oil in the marinade, seemed to increase, rather than counteract, swordfish’s natural oiliness. Even fresh lemon juice couldn’t redeem it. Possibly my fish steak wasn’t as fresh as it could have been? I loved all the swordfish I’d eaten in Sicily. Maybe if my fish had been caught in the Straits of Messina, by the local ages-old method, and brought to the table within a day, it would have been a whole different thing. Maybe I ruined it by my inattention to detail in the frying. 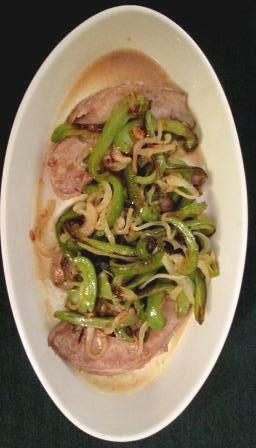 Or maybe Marcella didn’t entirely succeed in translating the Sicilian dish for the American kitchen. Or possibly all of the above: there are days like that.